Wycoller is a small village about three miles south east of Colne in Lancashire, not far from the border with West Yorkshire. It became almost deserted around the middle of the twentieth century, but it has recovered since the 1970s and is now an attractive place to live and a popular destination for visitors. The village lies in a valley known as Wycoller Dene. Wycoller Beck flows down the valley and through the village. According to John Bentley the village probably developed during the medieval period, possibly to provide housing for herdsmen employed on the local farms. John Bentley, Portrait of Wycoller, Nelson Local History Society, 1975. At that time Wycoller formed part of the Forest of Trawden. The area specialised in cattle rearing, with much of the Forest of Trawden being divided into five estates known as vaccaries. Two of the vaccaries, Nether-Wycoller and Over-Wycoller, lay in Wycoller Dene. Cattle would have been grazed on the slopes and in meadows close to the river during the winter, and then taken to the moorland above the valley during the summer. 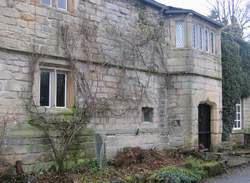 In Portrait of Wycoller John Bentley has used contemporary documentary evidence to give a picture of the way the vaccaries would have functioned. One aim would have been to breed oxen needed for ploughing and for pulling carts used to transport goods. In addition, cows would have been kept for milk, meat, and the production of leather. The records indicate that the cattle had to be protected from attacks by wolves. The records also show that cattle were kept alive during the winter, staying in cowsheds or in sheltered fields that provided pasture throughout the year, and using hay when necessary. Deer and other wild animals were likely to be a nuisance to the farmers, but it was an offence against forest law to kill them as they were regarded as belonging to the king. In 1341 the annual rent for each vaccary in Wycoller was 46s 8d. Vaccary employees would receive 2s for building a cattle fold, 6s for felling timber for alterations to a shippon and for the carpentry on the site, 12d for carrying timber, 17½d for iron nails, 6d for clearing the site, 3s for mowing rushes for thatching, and 2s 6d for building a house for heifers. 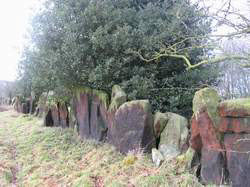 On the slopes above the village you can still see walls constructed from large upright stone slabs with their lower sections sunk in the ground. These walls are thought to date from the time of the vaccaries. During the Tudor period Wycoller and the surrounding area became more prosperous, partly as a result of the rise of the textile trade. By this time farms were stocked with sheep and fewer cattle. A lot of evidence reveals that people in Wycoller combined farming work with the preparation of wool, spinning, weaving, and the manufacture of clothing. Inventories compiled after a death give lists of possessions, and during the sixteenth and seventeenth century Wycoller residents often left both farm animals and agricultural implements and also wool and equipment used in the making of woollen cloth. Elizabeth Emmott, for example, a widow who died in 1581, owned 101 sheep and 20 lambs. Her other possessions included fleeces and broken wool. Presumably she was involved in the initial stages of cleaning and carding wool. Roger Hartley, who died in 1589, owned such items as ploughs, oat meal, and malt, but he also had cards, wheels, and combs, two pairs of looms, and quantities of woollen and linen cloth. He must have been a weaver or else employed people to use his looms. When William Hargreaves died in 1598 he was described as a clothier, an indication that he traded in finished cloth. Other evidence of weaving and cloth production is still apparent today. Beside the entrance to Pearson's Farm you can see several wuzzin holes. They were created when wet yarn was dried out before being woven; the yarn was rotated rapidly in a basket on a stick held in place against the wall. A field above Wycoller Hall is known as Tenter Field, a name that recalls the process in which new cloth was placed on a tenter frame and held in place by tenterhooks while it dried.